I hope everyone had a wonderful Christmas! If it was busy you are probably doing a little bit of this right now...relaxing. As you can see, we are in Dunderton's house. I created a little scene using Sofa So Good image and Derek & Deirdery Dunderton image. The truth of the matter is Deirdery got up to get something to eat and their dog decided to take a sip of her tea and steal the nice warm spot that was left behind. We have all been there before. I figured since Deirdery was stylish with her purple hair, that she would have purple wallpaper that is just as funky as her. This card might be used as a retirement card, which would be perfect. 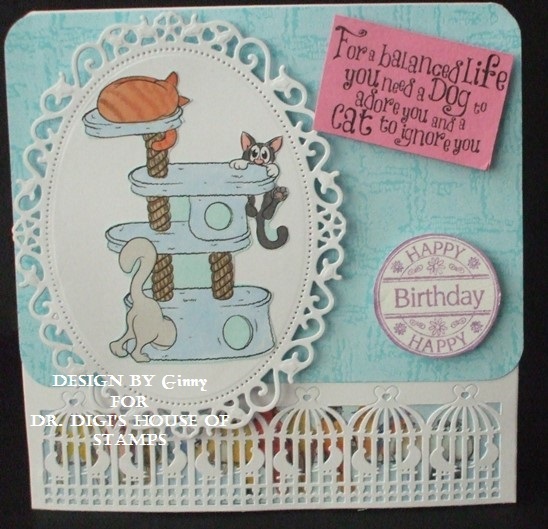 The designer paper is from Dr Digi Polos Backing Paper, as well as the sentiment from Pet Sentiment Sheet. There is more info on my blog. Happy New Year Dr Digi Friends!!! 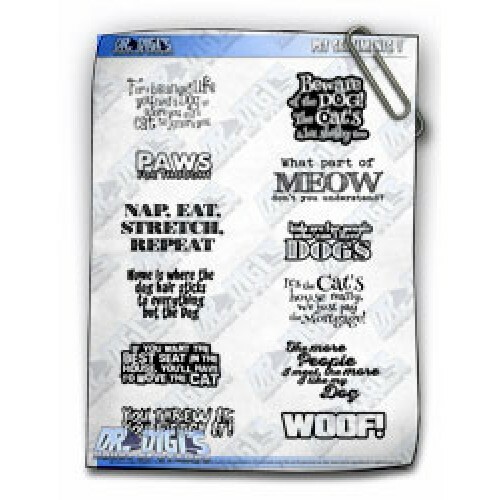 Another of those handy gift card wallets. This time I've been rather good and have recycled a colleagues Graze box - the card is really decent quality and the inside pattern changes regularly. Of course, I did let him finish the contents of the box! 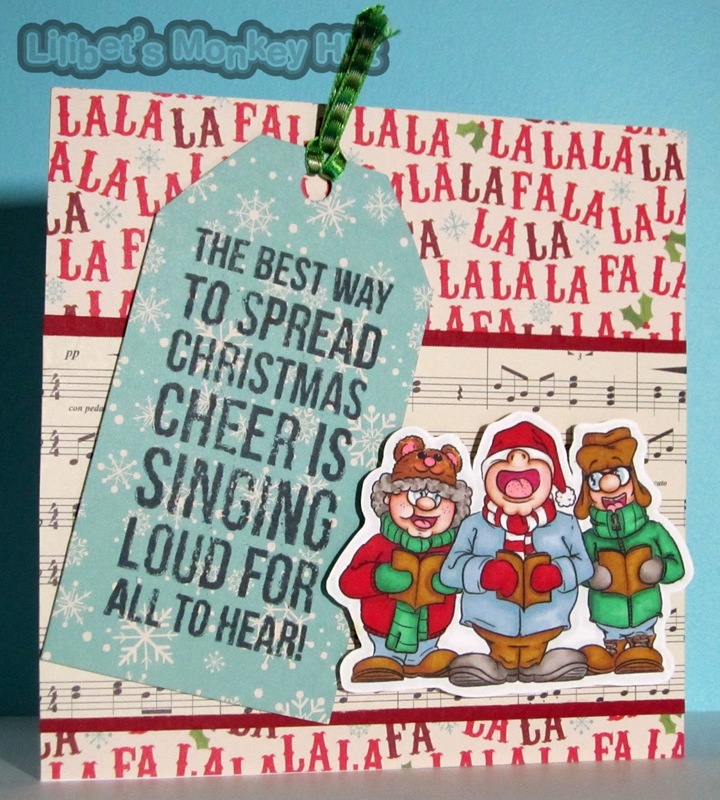 I've used the wonderful Christmas Sentiments Sheet 01 for the sentiment - quick and easy to use! Good morning all hope you had a wonderful Christmas. I made three of these cards to give to the football coaches that my youngest son plays for - the tag on the sack I hand wrote and its the teams initials. 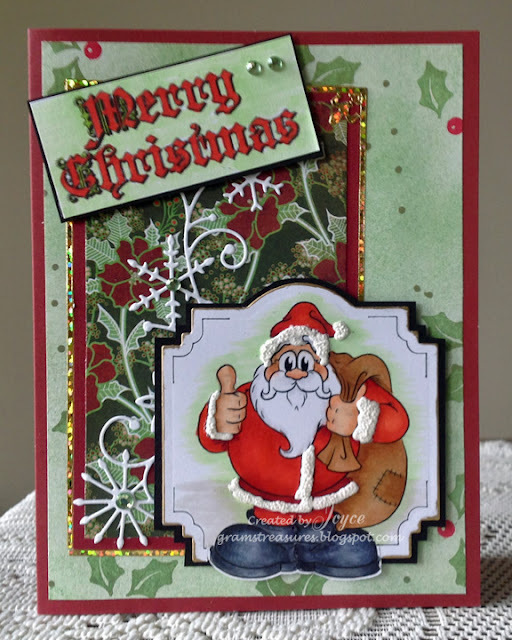 Simply Santa (coloured) plus balls digi and a little bit of sparkle and the card is complete! Daisy and the hound are in their element singing "Happy Birthday to you." I love the sound of a saxophone, thankfully lots of new singers and groups include a saxophone. My favourite is Baker Street by Gerry Rafferty and Take That’s A Million Love Songs. I'm dreaming of a wide Christmas. Firstly a confession... I am cheeting a little today! 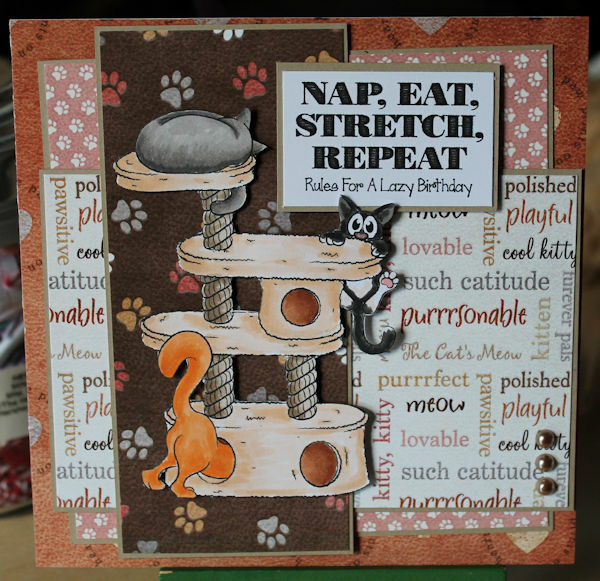 I made this card a week or so ago for another challenge but I have had a pretty busy week so I haven't had chance to make another. I hope you don't mind and I love this image so thought a great one to show you before Christmas. This image is called I'm Dreaming of a Wide Christmas. I think our Deirdrey has over indulged a little - and it's not just food she can't get enough of... The minx! Flaunting herself like that! I predict my thighs my be this wobbly after Christmas... I always eat & drink too much and with the weather being so wet ... I am training very little. Although there has hardly been a spare minute to go out running (that's my excuse and I am sticking to it!) So I am dreaming of a slimmer 2016 but that wont stop an indulgent Christmas first! If you'd like to see the full card recipe - take a look here. This will be my last post before Christmas so - I hope you are all enjoying the festive season and have a lovely time however you will be spending the holidays. It won't be long now, until the big guy is sliding down the chimney. He's thumbs up and ready to go! 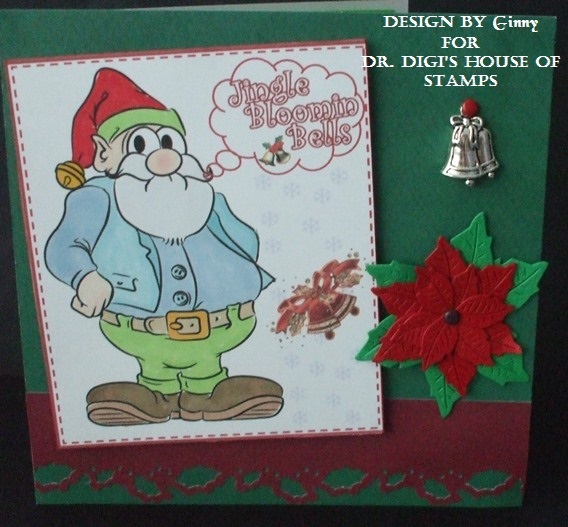 This is one of the new Christmas digis from Dr Digi's House of Stamps....titled Simply Santa. Fun to colour and sure to be a hit with the little ones. The sentiment is also one of Dr Digi's creations and can be found here. Now, if I could just speed things up a bit so that I could be ready for the big day too! Crikey, I am going to forget my head before long, I forgot today was Friday, I got an unexpected new job and all of a sudden my organised but busy week became disorganised chaos! 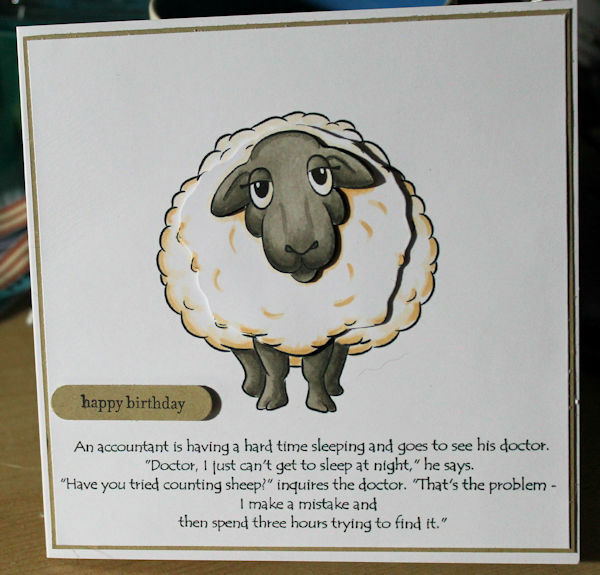 I made this card for my middle son's birthday yesterday, he is training to be an accountant and Flossy fit the joke perfectly! You can find Flossy HERE, and the joke on Google! I hope you all have a lovely weekend, I will yet again be helping out on a market in the pouring rain, and have a wonderful Christmas. Just a little over a week until Christmas! I know the kids are getting excited, I bet some adults are too. Tina here with another Dr Digi Christmas card. If your wallet is feeling a little flat and you need to make a Christmas card for a forgotten neighbor or maybe your whole Christmas card list, this image is perfect for you. 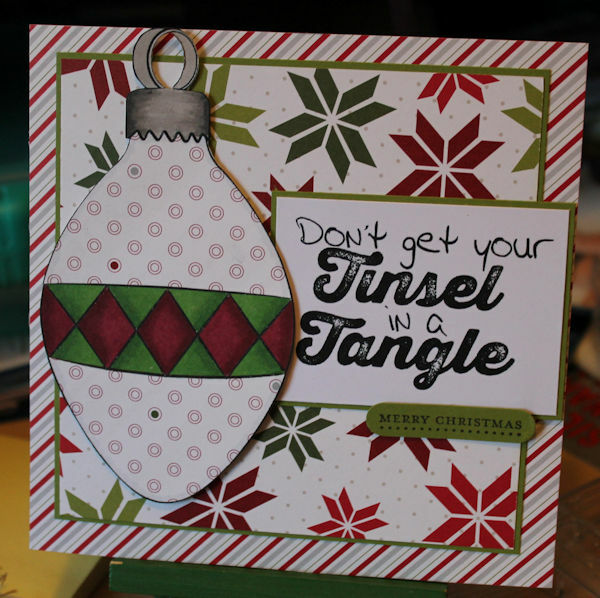 This is a freebie called Bauble at Dr Digi House of Stamps. Even though I use just one of the image, imagine shrinking it down and hanging a few of them on a card. 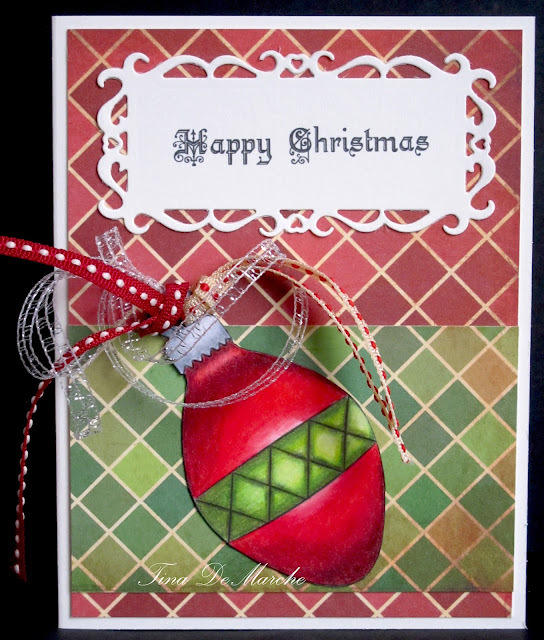 I also used the Christmas Sentiments Sheet for the sentiment and Distressed Diamonds Paper. Stuck for what to have in for the unexpected visitor over the Christmas period but don't want to look like you've not prepared? 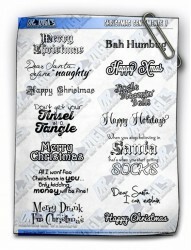 Well look no further than the ever so versatile Christmas Sentiments Sheet 01. 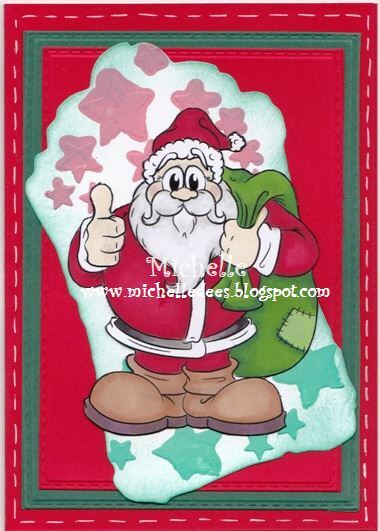 Santa has his thumbs up because all the toys are all made and packed ready for Christmas Eve. He is so jolly is because he knows where all the bad girls live. 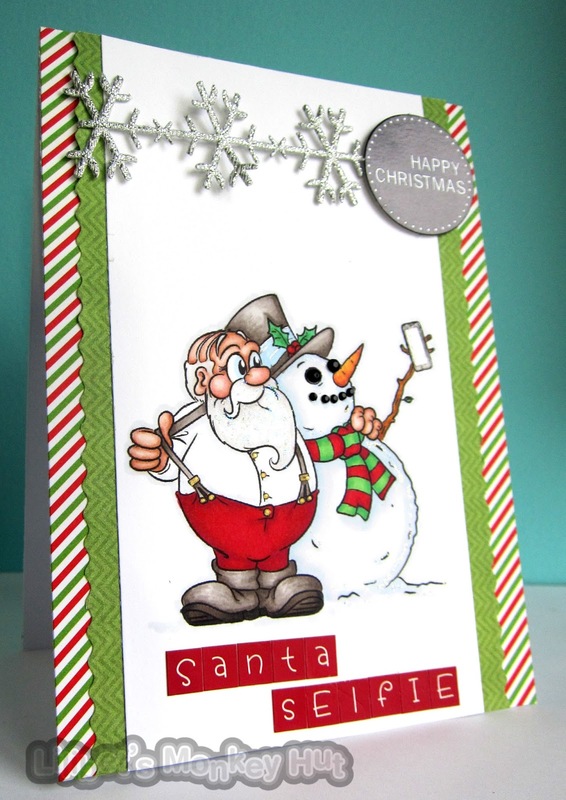 You can also find a Precoloured Simply Santa. Morning everyone. It's my turn to showcase another image from Dr Digi and today I have used We three Kings. This is such a fun image to colour and use on a card. And I had lots of muiscial themed Christmas papers that went perfectly. You don't tend to get Carol singers anymore which is a bit of a shame as its such a Christmas tradition and I love a good sing somg. Sorry its a quick post but I have soooo much to do... and I've still not made the family cards!! 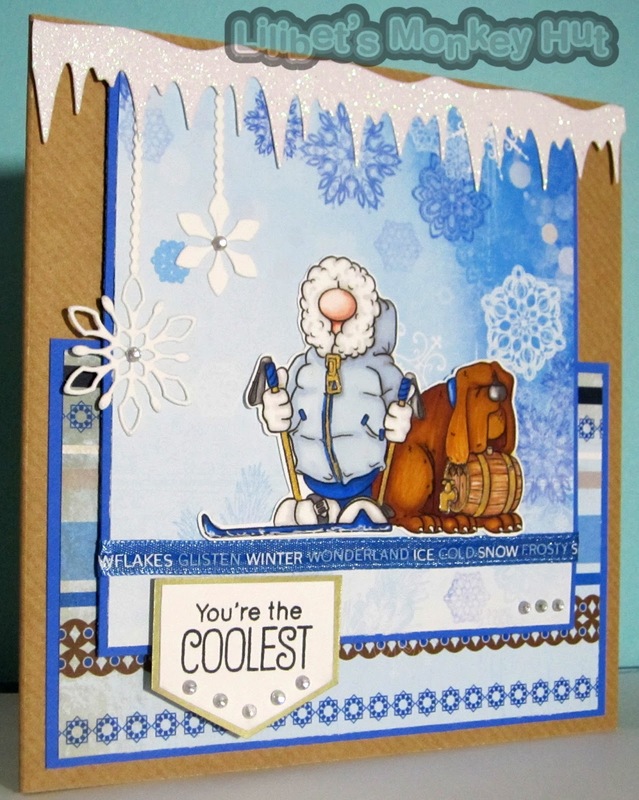 If you would like to see the full recipe for this card - have a look at the blog. Hope your all well and have a great day. I don't believe so much was fortuneteller have to tell. But at Mabel's little table I waited and heard what she can tell me. And she told me the year 2016 will be great. 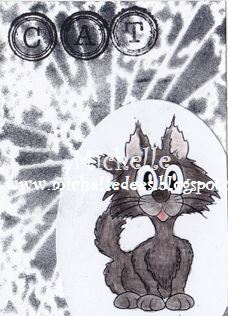 The image is called Mystic Mabel. Want to know how I did this pojeckt, HERE is my blog. Two images, simply perfect for those who'd rather spend the entire festive season under a duvet. Candy and Flossy images available in the store. 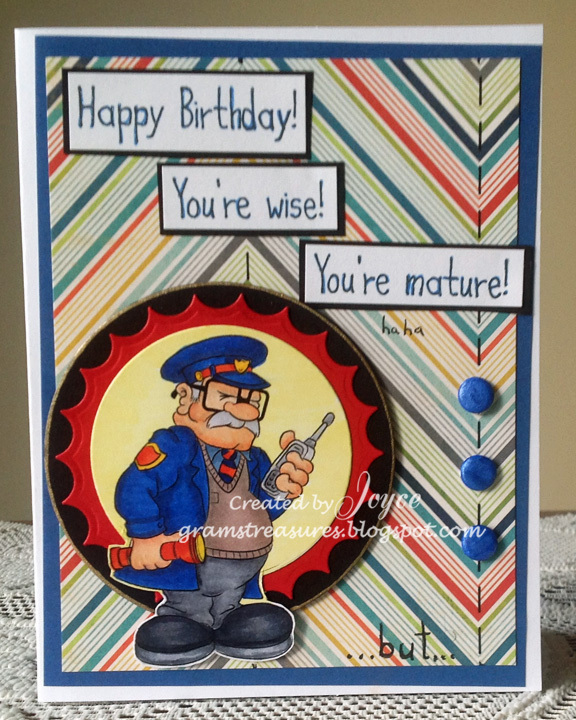 So without further a do... here is my card using Rescue Squad. I kept it all Cool using blues and whites as its a fab image to use for all those difficult men in your life! 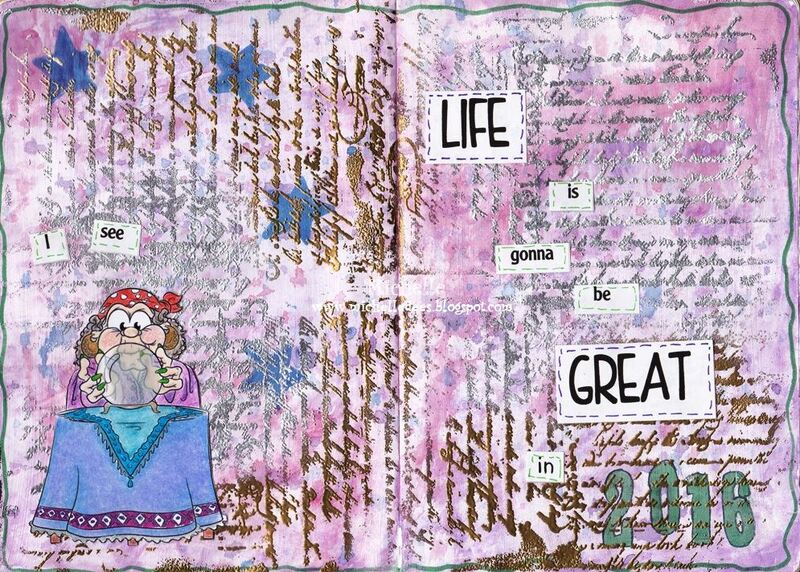 I stayed with the manly theme and added the Kraft and brown but couldn't resist a few gems and a bit of sparkle. The weather is a bit grizzly so it the perfect excuse to no stray away from my desk... who knows I may even train my dog to bring me a little glass of sherry to keep me going!! 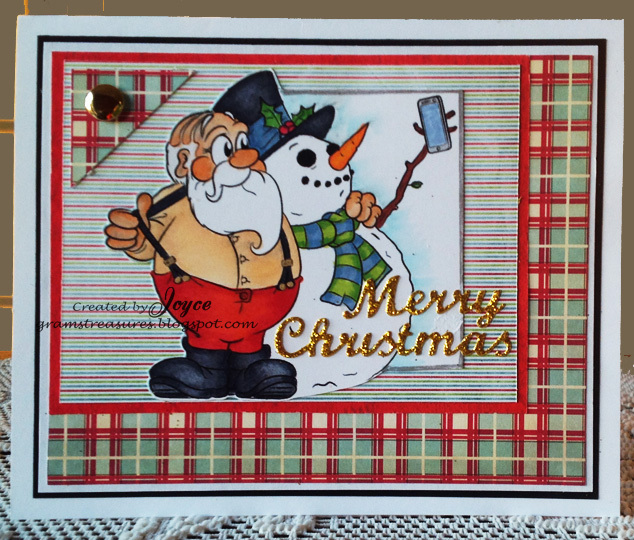 If you would like to see the full recipe for this card - stop by my blog. With Christmas just around the corner, Santa decided he needed his picture taken, and his friend Frosty was glad to oblige. 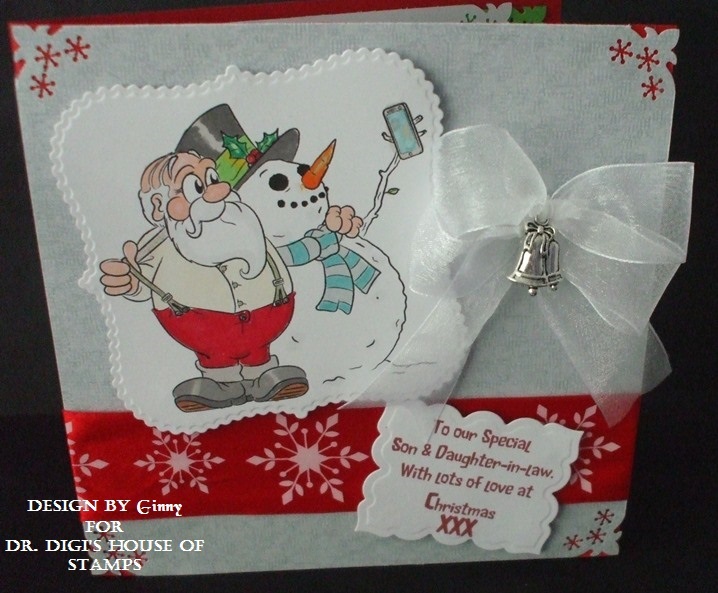 Another fun new image from Dr Digi's House of Stamps....this one is titled Selfie Santa. How cute is that, and so in keeping with the times! I have to say that Nightcap Derek is one of my favourite images, not least because this is the third time I've used him this year. However it was my Dad's 76th birthday yesterday and I thought this was perfect, he's fond of a nap or several and his present was the very exciting pair of slippers! You can find Nightcap Derek HERE and the sentiment comes from Funny Sentiments Sheet 2 which can be found HERE. If you could send get well wishes to Dr Digi this week, we'd be grateful, he had a frontal lobotomy procedure this week and I think Mrs Digi is seriously regretting leaving him with a bell in the bedroom whilst he undertakes a couple of days bed rest. 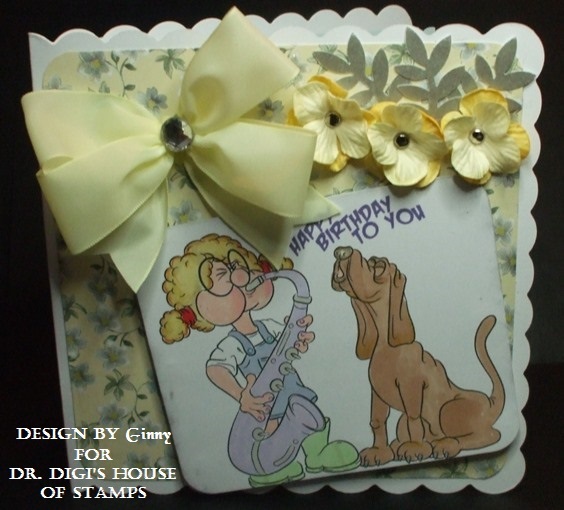 Tina here for Dr Digi's House of Stamps. We seem to forgot that not everyone has a white Christmas, so this Surfin' Santa is riding the waves..maybe in Australia. Isn't he one hunky dude? Hopefully Santa is done delivery all those gifts before his playtime on the beach. Surf's Up Dudes!! I also used Christmas Sentiments Sheet. recipe is on my blog. The Christmas Sentiment sheet is perfect for when you need to make a gift card holder in a hurry for that awkward male in your family. 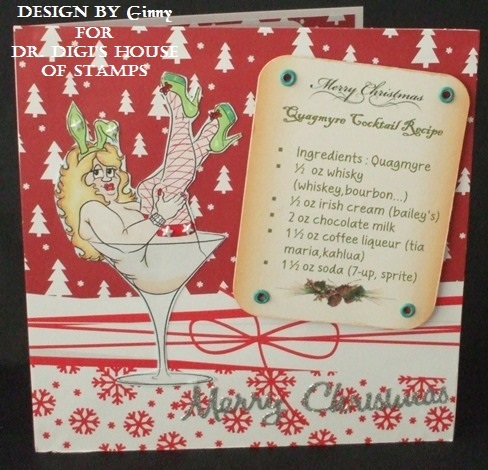 Christmas party season is nearly upon us and Martini Bianca from Dr. Digi's House of Stamps is not going to miss out. She has discovered a new cocktail called Quagmyre it is chocolate based and oh so yummy! Peg Leg Pete - Takes a stand. Morning - I thought I'd have a break from the christmas creations just before December kicks in and the festive period takes hold. 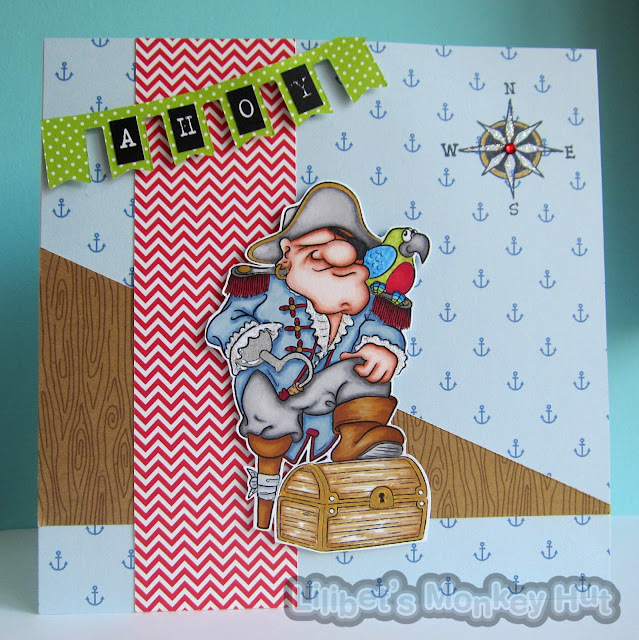 So I have used Peg leg Pete to make something a bit different. I do love Christmas but it seems to start earlier and earlier every year... I refuse to put my decorations up until December starts but then don't want to take them down as everywhere looks so bare afterwards. So I am taking a stand and Peg Leg Pete is my little bit of rebellion against the early Christmas... He is such a fab image and so full of character. I purposefully added a general greeting so I can use this card for any occasion. Right - I need to go and get ready for Church. Need to pray for some dry weather as we are off to York for a few days to make a dint in the Christmas shopping. Excited as we are going to Jamie Oliver's restaurant for dinner one night too... You know how much I love my food! If you would like the full recipe for this card - take a look at my blog. 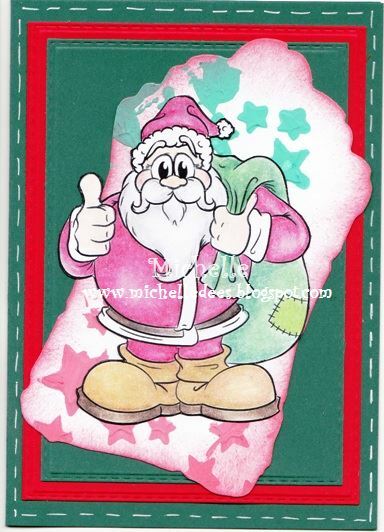 I made two cards with the new christmas image Simply Santa. I coloured one with pencils and one with promarkers. 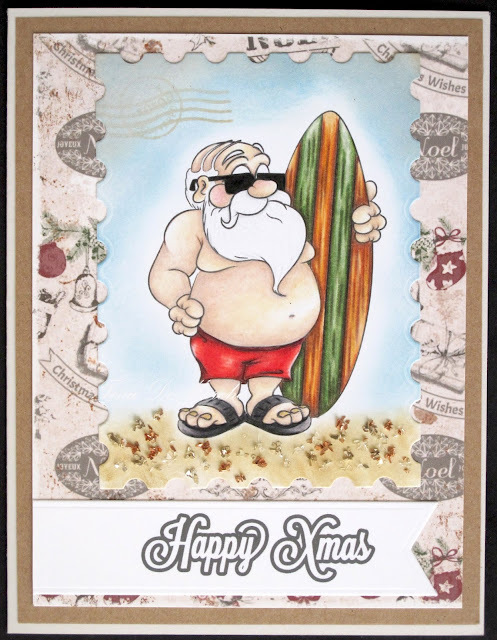 So for some quick cards you can also take the precoloured Simply Santa. Have a good weekend, see you next time. Need a card in a rush? We are all pretty busy at Christmas. 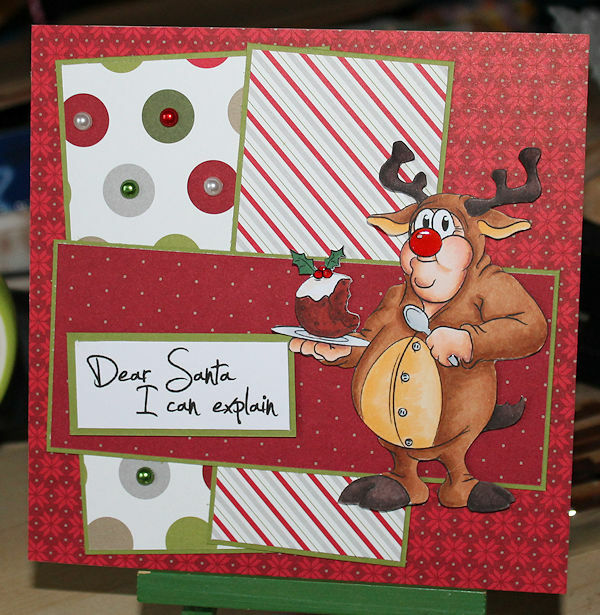 I've used the brilliant pre coloured Simply Santa, although I have added a trusty reindeer. Isn't the snowman backing paper fantastic, so much fun. HERE. Have a good weekend everyone, I will be on a market stall in the wind and rain and at a Christmas Fair. 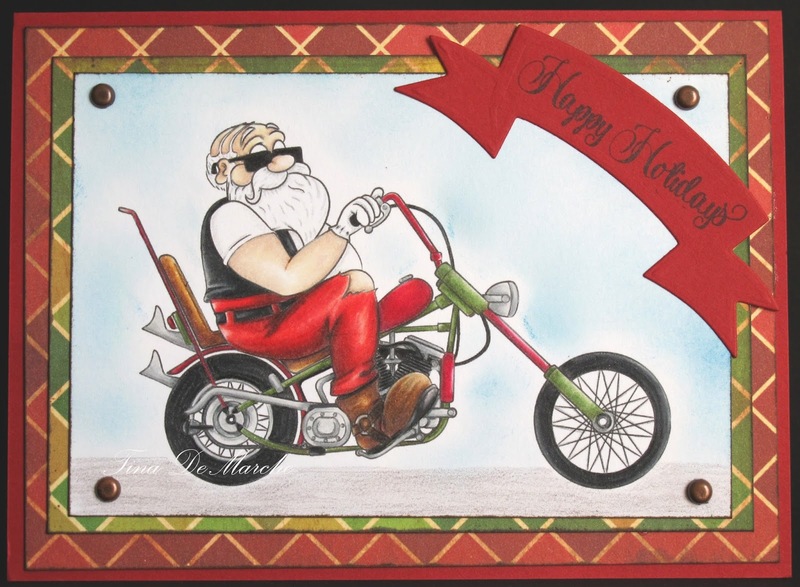 An extra card from me this week could not wait to use this fabulous image. Now this is a great digi if you're in a hurry to make a quick Christmas card, and even better as this is the pre-coloured version! 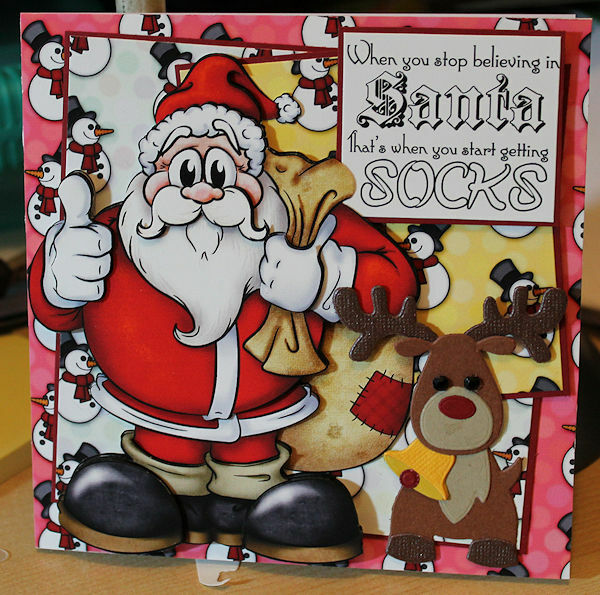 Go get Simply Santa Colour from the store - you won't regret it! Grimble Grumble from Dr. Digi's House of Stamps is a grumpy old gnome. He hates Christmas because he has so much extra work to do. He has been standing in the garden all summer in all weathers and just wanted some time for himself. Morning All - Sorry I'm a little later than usual posting this morning but its because I'm using this "Hot of the pencil" image.... Called Santa Selfie. This will be available very soon to buy -so watch the website! I actually added loads of glitter but not sure you can see it very well in this photo... glitter for snow is compulsory in my opinion. I saw this image and had to have it - Its traditional christmas with the very modern phenomenon that is the Selfie!! I have so many friends that this image is perfect for. We had our Girls night out on Friday and headed to the Christmas markets in Chester - It really got me in the Festive spirit - as did the Gluhwein!! I love Christmas but when is it appropriate to put up the decorations... It has to be December at least for me but there is a fully decorated tree in a neighbouring house. So i'll witter no on more and let you see this fab new image! 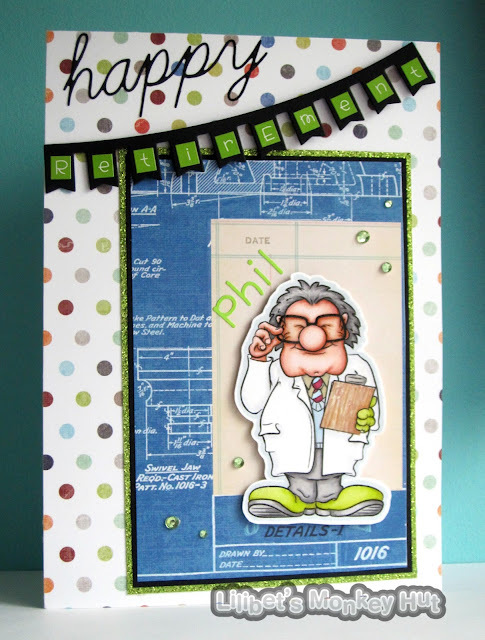 If you would like the full recipe for this card - pop over to my blog. Sometimes you just want to say Hi, or give a little encouragement. 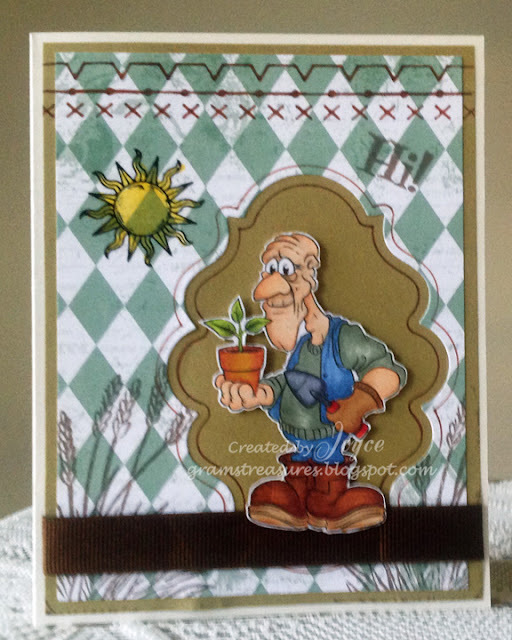 Today, my card for Dr Digi's House of Stamps, is using the Toolshed Ted image. I'm sure he's been putting his gardens to bed for the winter (just like me! ), but just wants to save this one little plant for his windowsill. Of course, he looks a little puzzled....perhaps he's just trying to decide if it's really a plant, or just a weed. Hmmm. 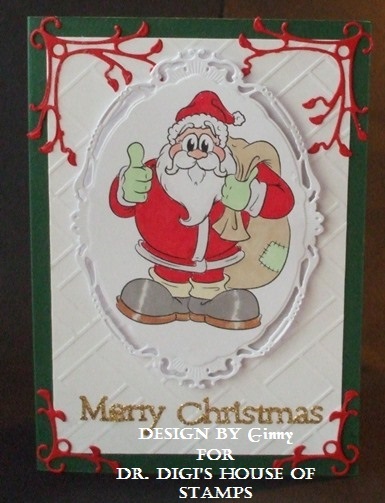 Back onto making Christmas cards this week and this is a perfect image because it is free!! Yep free, gratis but I bet you can't go to Dr Digi's website without putting more than a bauble into your basket! I've made this card for a photography mad (or should that be mad photographer) who will be celebrating his Birthday soon. Made using the very versatile Camera digi. As it will soon be Christmas party season Christmas Chris thought he would get into the spirit of things early and we have just caught him having his favourite Christmas offering! At least he has dressed up for it in this reindeer onesie. This morning as I'm off to church... We are going because I want to get married in the lovely little village church just down the road from where we are putting the Tipi for the reception. We get married in May but have to attend for 6 months. 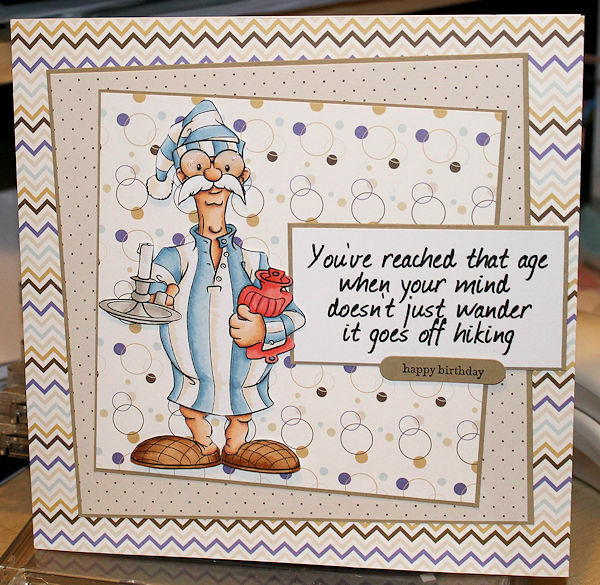 If you want the full lowdown on this card - pop to my blog. 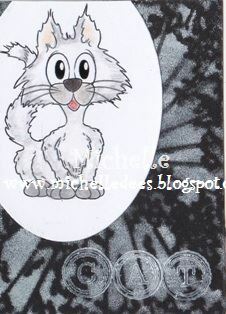 Today I used the cat Schrödinger for two ATC. I coloured him black and white. And so I made the background of the ATC also black and white. I think both colours are great for him. So HERE you find lots of more great digital stamps. 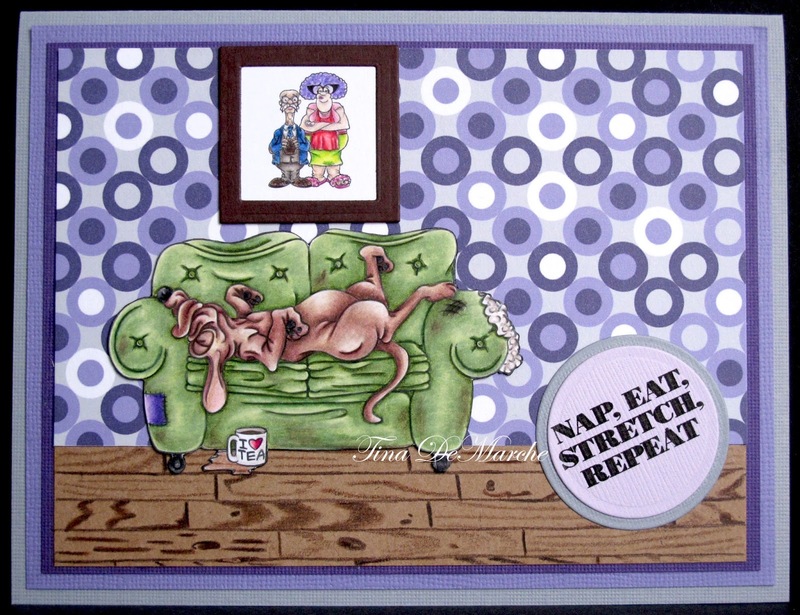 And HERE can you read more about my ATC. Here's my latest card using the newest Dr Digi image which he made with me in mind (no one dare argue otherwise thank you!!). Add another couple of cats and this would be my house, at the moment you can see Elmo on the top, Frodo clinging on for dear life and Jasper disappearing into the bottom. Makoto and Ossie are clearly off elsewhere doing cat things, probably involving choosing which rodent to present me with next. I keep telling them that bringing in live field mice is not going to win them any prizes but will they listen? You can find this fab new digistamp HERE and you can find a wonderful new collection of sentiments for pets HERE. Hope you all have a good weekend, we are expecting a monsoon here because apparently Manchester does not get enough rain already! Need a card in a hurry? Look no further than colour Hole In One Hal and his matching background! Just print, snip and stick! 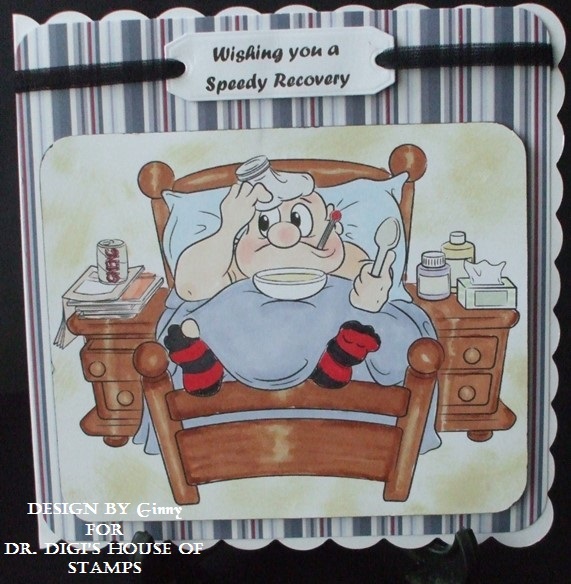 It is that time of year when we are getting coughs colds as is the case here Man Flu Dr. Digi's House of Stamps he has his bowl of chicken soup lots of pills magazines. He feeling very sorry for himself with his over exaggerate claims that he has the flu! Rememberance Day with Corporal Clegg. 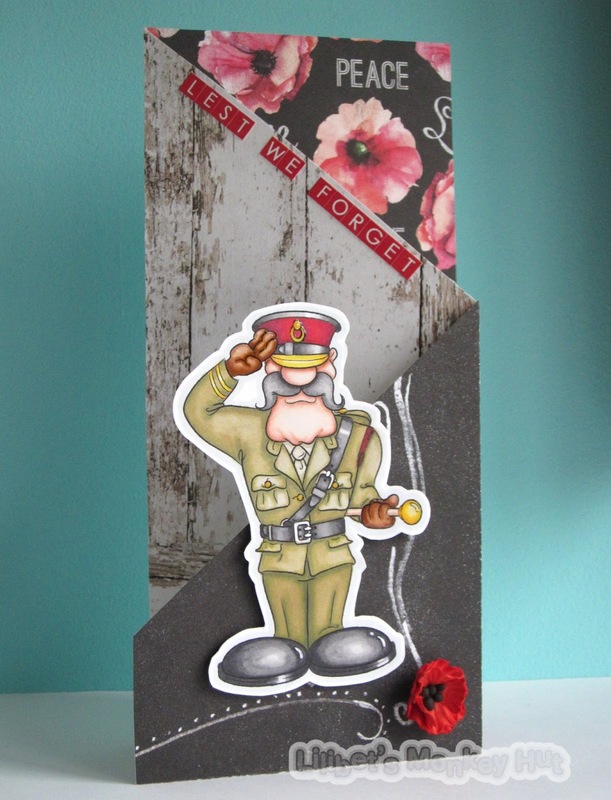 Good Morning - Today is Remembrance Sunday so I have made today's card using Corporal Clegg. I really wanted to use the poppy paper but mixed it with the wood effect to create some harsh contrast to the pretty flowers - I guess that's part of the symbolism of the Poppy in War. I am really interested in my family history and have done a huge family tree. I found one relative who was in a prisoner of war camp and died two days before liberation - So sad! I managed to find where his war grave is in Belgium and was able to have his story remembered by the Royal British legion campaign to commemorate every fallen solider. It really is an amazing and interesting site and really quite easy to find any relatives they may have been involved in the Wars. Can you believe it? The weekend is here again! Now for some of us, that is just one more thing to remember...lol. Today I've made a fun birthday card using the Night Shift Shaun image from Dr Digi's House of Stamps. Sure to bring a smile (or not...) when they read the inside. It's November so I thought I had better get started on a few more Christmas cards; every year I say I will make a couple a week then I won't be in a mad rush, you, of course, know how that plan goes! As you can see here Christmas Chris has gotten started early on the Christmas pudding, there will be some very unimpressed people on the day itself if there's none to be had! You can find Christmas Chris HERE and check out the rest of the Christmas section for more seasonal digis; between you and me I think there may be some more arriving in the store in the next few weeks, but don't tell Dr Digi I told you! 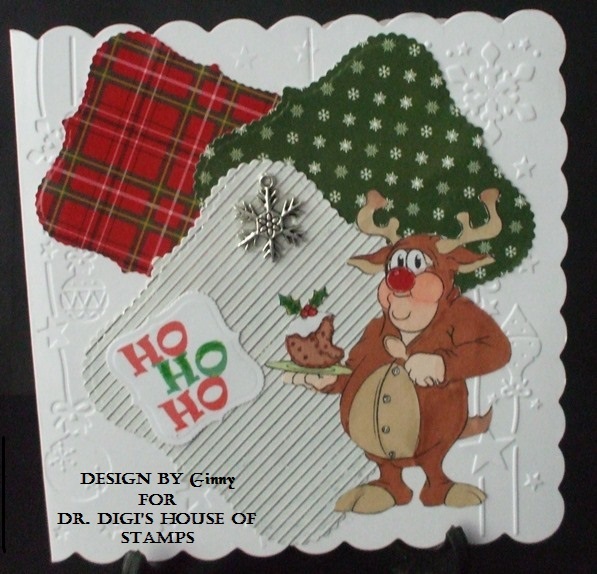 Hello, Tina here with my first DT post for Dr. Digi's House of Stamps. 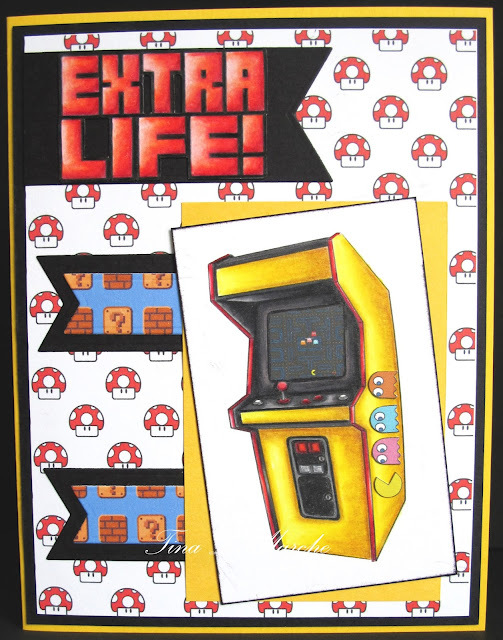 I'm sharing a fun "Get Well" card using Arcade Machine for the gamer in your life. 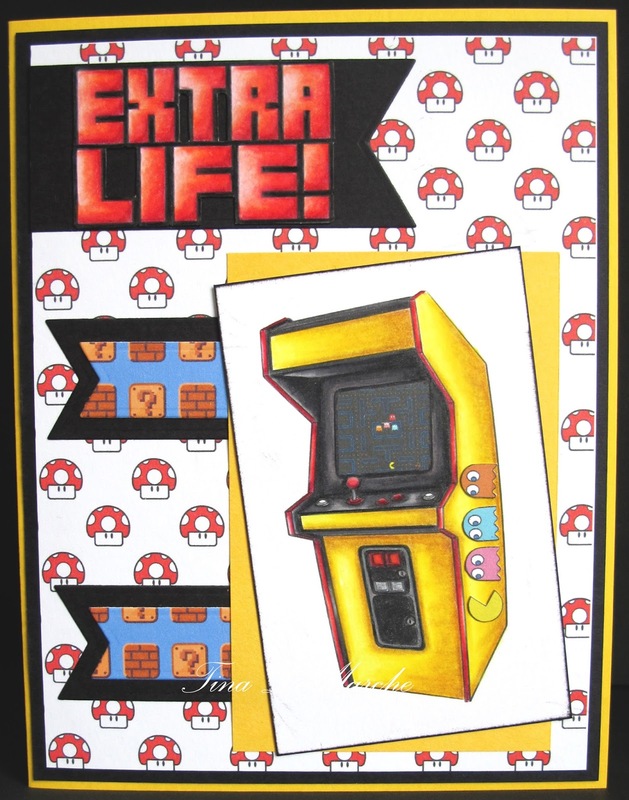 To complete this full arcade scene, I also used Techy Sentiments and Arcade Addict Backing Paper. This was such a fun card to make and my oldest son gave it thumbs up...yes, he's gamer. Basically, never trust snow that is yellow. And what ever you do, never eat it. Recycling at its best - last year's Christmas card with an added Dr Digi Snowman. As the weather is now changing and winter will soon be upon us Hole in one Hal has decided a day on the golf course is in order. He is so vain and won’t wear his spectacle. 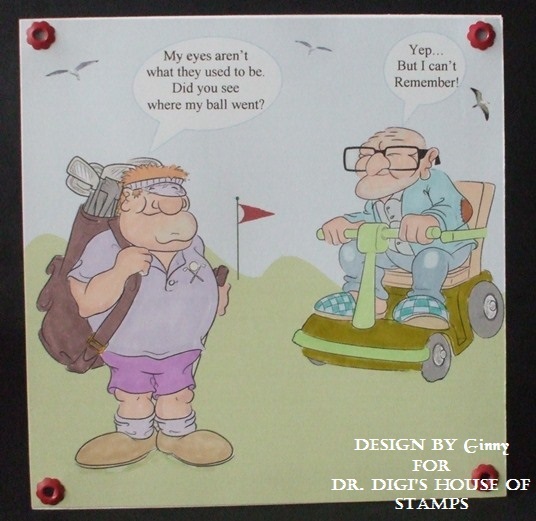 He thought he would ask Mobility Malcolm if he had seen where his last putt had landed! He might just as well asked the birds for all the good it did him.